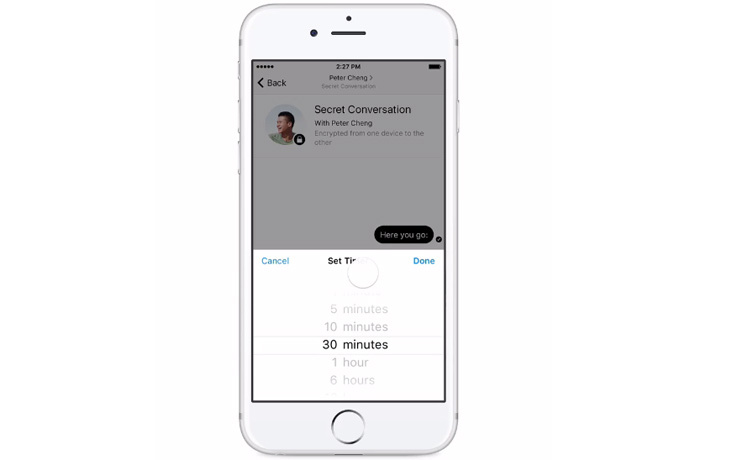 Facebook Messenger Secret Conversations Testing: Facebook Messenger’s David Marcus shared a new updating version of Facebook Messenger on his Facebook post today. According to his post, he said that your secret messages will be disappeared it you set a timer for that. This new updating feature is named as “Secret Conversations.” It is an encrypted message that end-to-end from the sender to receiver. “Providing more ways for people to safely share is an important part of making the world more open and connected. Whether you’re asking a doctor for medical advice, sending sensitive account information to your spouse, or even your Social Security Number, it’s important to have options available for sharing these kinds of very sensitive messages. That’s why I’m glad to announce that Messenger is starting to test a feature called secret conversations that will both encrypt messages end-to-end, and enable you to set a timer to control how long each message you send stays visible in the conversation on both devices (yours and your recipient’s). To be clear, your existing “regular” messages and calls on Messenger already benefit from strong security systems as Messenger uses secure communications channels — just like banking services — all around. But we’re rolling out this additional capability as an option for the most sensitive conversations you might need to have. We’re making this an optional feature because a number of popular Messenger features don’t currently work, or can’t work with end-to-end encrypted conversations, like using Messenger across multiple devices, archiving all your past conversations in case you lose your phone, and sending rich content like animated GIFs.